Home of the world famous TPC Stadium Course, Sawgrass Marriott Golf Resort has cemented itself as one of the most iconic destinations in all of golf. 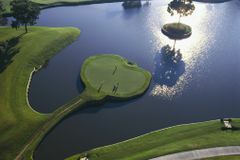 As the annual host of The PLAYERS Championship, TPC Sawgrass sees the best golfers in the world take on the fearsome Island Green on the par-3 17th. Heading to Sawgrass for your golf holiday offers the rare opportunity to walk in the footsteps of your favourite players, a bucket list experience for golfers the world over. The Sawgrass Resort is set on Florida’s stunning Atlantic coast, for those flying there it’s best to go direct to Orlando International Airport which is just a 2-hour drive away. A popular option is to spend some time at Orlando’s epic theme parks before heading east to Sawgrass and Daytona Beach. As well as the TPC Stadium Course, there are four other championship layouts at Sawgrass, as well as a host of other great courses within a short drive of the resort. Another popular attraction for golfers is The World Golf Hall of Fame is in St Augustine, just south of Sawgrass. One thing is for sure, any golf holiday that includes a trip to Sawgrass will be one you remember. Pete Dye's TPC Stadium Course is among the most famous in the world, and is the annual host to the so-called ‘fifth major', the Players Championship. The highlight, which goes without saying, is the incredible 17th hole with its island green, which has to be one of the most exhilarating golf experiences anywhere. Look past the most discussed hole and the TPC Stadium Course presents an exacting 6,954 yard layout, whose fairways and greens are pristine. No less than $30 million has been invested in the course, and the work completed in 2006 has affirmed the amazing Players' Course at the forefront of golf in Florida and beyond. The trophy and awards cabinet of the TPC Stadium Course is already overflowing, but it has recently been ranked 5th in Golf Magazine's list of the ‘Top 100 Courses You Can Play'. Awards: No 2 course in Florida (Golf Digest), 41st in top 50 courses in country (Golf Digest) (for 2011), 5th for Golf Magazines list of 'Top 100 courses you can play'. The concept for the signature hole for Sawgrass was supposedly drawn up on the back of a cocktail napkin by Alice Dye. It has now become one of the most famous holes in golf and one which Luke Donald branded as "Do or Die. The island green is a favourite amongst many PGA Tour players and coming in at 17 has been known to make or break a round. A must play hole for any golfer. The latest addition to Sawgrass' already impressive portfolio is Pete Dye's Valley Course, which is already regarded as being worthy of standing side-by-side with the TPC Stadium Course, and has also hosted the PGA Tour's finest. The ambitious project reflects Dye's extravagant design ethos, and the result is a magnificent 6,838 yard championship layout overflowing with water and sand. Perfectly manicured fairways and slick, sweeping greens are among the characteristics that make the Valley so popular. Sawgrass Country Club played host to the Players Championship from 1977 to 1981, and was designed by Ed Seay, an associate of Arnold Palmer's architectural organisation. The 27 holes are combined to produce the East and West rotations, with a maximum length of 7,072 yards. Whichever combination you are lucky enough to play, enjoyment and challenge are guaranteed at a course which Golf Digest included in its list of the ‘Best 25 Golf Courses'. Intracoastal marshland and towering pines set the backdrop for the Marsh Landing Country Club, which boasts a 6,841 yard championship layout devised by Ed Seay, who also conceived the superb links at the Sawgrass Country Club. The two nines are truly distinct, but both offer a good test and the chance to observe the estate's outstanding wildlife. The Ponte Vedra Country Club's course has been revised and greatly improved by Arnold Palmer and Ed Seay, and is set a stunning natural environment. Although it is short, Ponte Vedra Country Club is tight in places, demanding straight driving above all else. The signature hole is the short par 4 thirteenth, whose length is enticing, but there is water everywhere. Dancing and live entertainment are the order of the day at Champs Lounge. Bar and grill favourites overlooking the ocean are on offer at the Cabana Beach Club. The business complex is capable of hosting meetings, conferences and conventions of all sizes. YGT customised my golf trip to ensure that the courses, accommodation, car hire and flights were tailored to suit my bespoke wishes. YGT clearly had an in-depth understanding of all the options for the destinations that I was interested in. Speaking to an actual golfer about the options for a golf holiday is definitely a bonus! I arrived at Sawgrass on the Friday evening and was immediately seduced by the soothing atmosphere of the Marriot hotel and surrounding estate. Driving along PGA Tour Boulevard and Seven Mile Drive, seeing the pictures of past winners of the The Players Championship, makes you feel like you are in a very special golfing venue. The Saturday morning sunsine laid bare the full glory of the courses on the estate. Seeing the sun rise over the dew on the practice ground was a sight that any golfer would yearn for. I decided to have breakfast in the Sawgrass clubhouse whilst I looked over the course guide, to plot my way around the course hole by hole. The clubhouse feels like it has been there since the 19th century, such is the old world splendour of the building and the history behind the many pictures and stories. I was lucky enough to meet one of the many volunteers that morning, Hal Fletcher, who talked me through the history of the course as a venue for The Players Championship and its path from untouchable swamp land to one of the most revered golf venues in the world. Hal exuded the spirit of Sawgrass, was charming, funny and great company. He took me on a tour of the 16th, 17th and 18th holes too. Each turn on the route was accompanied by an anecdote that was unforgettable. Especially memorable was the story of infamous Angelo Spagnolo who carded a 3 over par 66...on the 17th alone! I played the Stadium and Valley courses on 2 occasions each. The pairings were fun and the anticipation on the 1st tee at Sawgrass was immense for each golfer in the group. From the pro-shop staff right through to the starter, everyone seemed to be in a romantic state because of the surroundings. This added to the all round experience on the day. YGT understand what it organise a great golf trip. Their staff and packages are first class and I can't wait to get in touch for my next trip.